OBERKOCHEN/Germany, 10.07.2012. 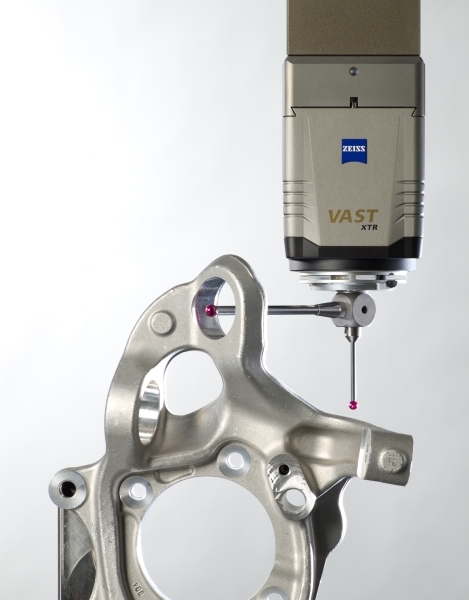 The new VAST XTR gold probe from Carl Zeiss enables flexible and highly accurate measure- ments in industrial measuring, thus considerably increasing productivity and flexibility for operators. Thanks to the integrated rotary axis, the VAST XTR gold turns the stylus system in the direction of the feature being measured and adjusts effortlessly to complex workpieces, thus enabling it to reach virtually any position. Until now, operators had to choose either a flexible stepping articulating probe holder featuring passive scanning not designed for maximum accuracies or a fixed scanning probe which is more accurate, but not as flexible. The VAST XTR gold combines the best of both worlds. The key feature is its integrated swivel joint. "It enables the stylus system to turn as far as possible in 15 degree increments and thus always be positioned at the right angle to the part," says Andreas Bucher, Product Manager at Carl Zeiss IMT. For special applications, this value can also be configured for any angle through the use of stylus systems. The VAST XTR gold is designed for long, heavy styli up to 350 millimeters long and 500 grams. The probe supports the navigator and perfor- mance functions. VAST navigator is an expert system that optimizes the measuring speed for the desired accuracy. The VAST performance function enables styli to scan interrupted contours without sacrificing speed or precision as in the past. The two functions increase efficiency considerably. Operators benefit from VAST XTR gold probes on many levels. They primarily save time because fewer stylus systems and modifications are required. They can also save costs on materials because fewer stylus systems are needed. Equipped with the precision of a standard, fixed stylus, the new probe is ideal for parts with many features and angular positions such as those on gear housings for helicopters and locomotives. VAST XTR gold is also suitable for rotationally symmetrical workpieces such as ventilation gears and turbines, such as those used for wind power. It provides users with added flexibility. Stylus change-outs are eliminated and the full utilization of the measuring range increases efficiency and ensures higher accuracy. VAST XTR gold is currently available for the following ZEISS systems: ACCURA II, GageMax, PRISMO and MMZ T II. Mathematicians Find a Way to Hide Waves Inside an Invisible "Hat"